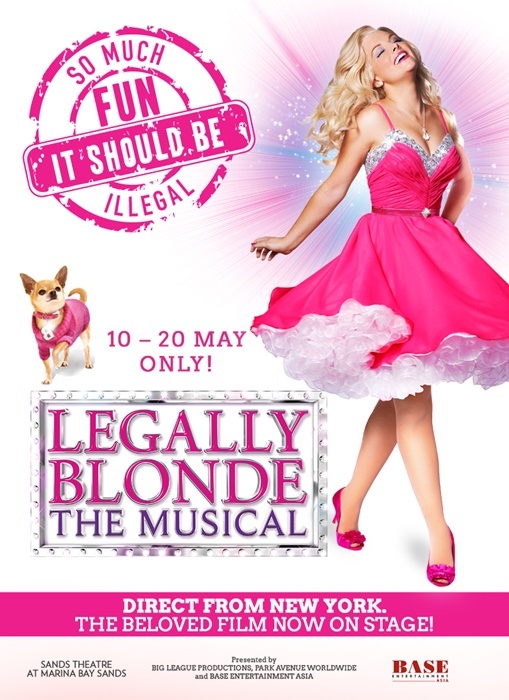 You are at:Home»ENTERTAINMENT»Legally Blonde The Musical is now in Singapore for the first time! Have you watched the hit movie, Legally Blonde starring Reese Witherspoon as Elle Woods in 2001? Legally Blonde is the ultimate feel good, comedy movie about Elle Woods who went all out to win back her ex-boyfriend by getting a law degree from the prestigious Harvard Law School. Omigod! Now, we can catch this pinky fun, quirky, and international award-winning Broadway Musical at Sands Theatre, Marina Bay Sands performing in Singapore for the first time! 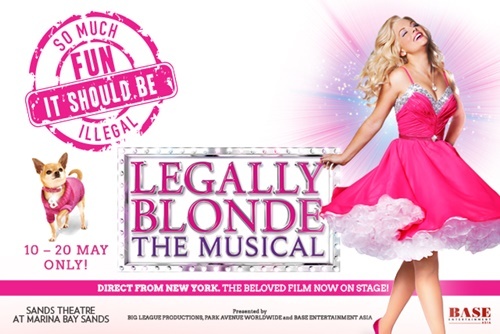 Maris McCulley is perfect for the role as the girlish blonde hair, pink-loving and stylish Elle Woods. She shows girl power that she will never take no for an answer, instead of feeling depressed over being dumped by her boyfriend, Warner who decided that he would like to be serious and embark on a law career by going to Harvard. Elle went all out to win him back by getting into Harvard Law School to prove to him that he is wrong about her. She is serious and not just another dumb blonde. Maris McCulley portrays her character flawlessly and she reminds us so much of Reese Witherspoon from the movie that captures our heart. Maris brings more depth to the character on stage with her stunning voice, she is funny with perfect comic timing and yet able to show the warm side of Elle Woods that we love. Wearing outrageous pink outfits can look so good and fashionable. Expect lots of energetic, high-octane singing and dancing in this romantic musical that will keep you entertained from the beginning to the end. This musical follows and celebrates the success of Elle who managed to overcome obstacles with positivity and at the same time, being true to yourself as that will never go out of style! 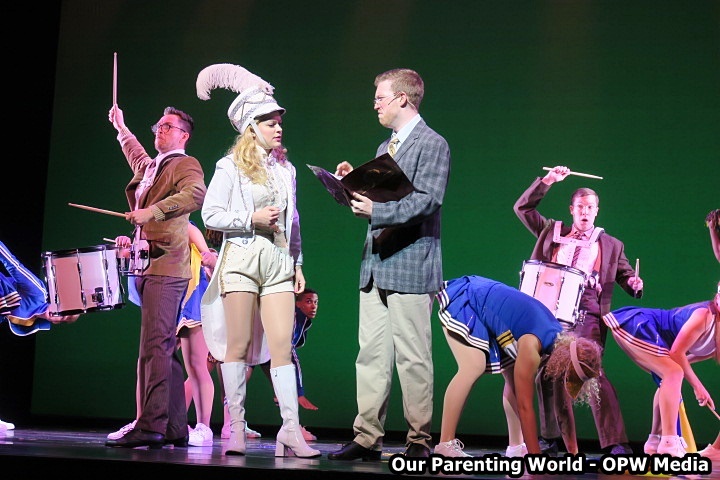 Besides Elle Woods, the musical is supported by excellent cast like the Greek Chorus made up of UCLA sorority sisters, Paulette the hairdresser who becomes Elle’s best friend, Warner the egotistic ex-boyfriend and Elle’s new friend, Emmett Forrest, a teaching assistant at Harvard. Never judge a blonde by her cover, Elle Woods proves that she can do it and at Harvard, she met someone more suitable for her, Emmett Forrest played by the charming, Jayson Speters. Emmett is always there for her and both of them have such great chemistry together. Towards the end of the musical, the lovely couple shared a special proposal of marriage much to the delight of the audience. Don’t miss this sparkling pink fabulous production with over 25 performers and 2 very adorable dogs, yes, real dogs from New York! Audience will be treated to an enjoyable time with happy, cheerful music, perky and catchy songs like Omigod You Guys! 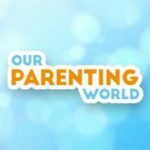 It is going to be lots of fun and yet heartwarming and inspirational experiences for all!